9 Mighty: He's A Sonic Clone? 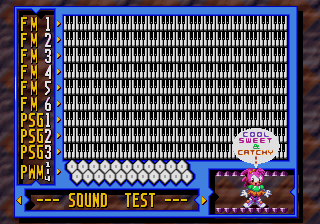 Amy, while not a playable character in Chaotix, nonetheless makes a cameo appearance as an unlockable for the sound test screen. Setting the first nine MARS color test values to 00 00 00, 06 0B 11 and 00 08 17 will cause Amy to appear in the bottom right of the sound test - she moves from side to side, with a speech bubble that says "Cool sweet & catchy!" 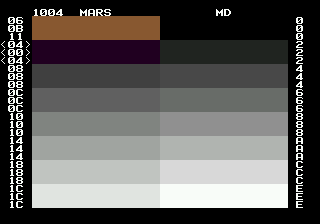 Set the first six MARS color test values to 06 0B 11 and 04 00 04 to add a "stage select" option to the main menu. From here you will be able to select a stage, the time of day, and the combination of characters. This also enables debug mode - during gameplay, press to pause the game, and you will be able to move freely around the level. World Entrance Level 0 is the normal world lobby, level 1 is the penultimate boss, level 2 is Metal Sonic Kai, and all the others crash the game. Special Stages number from 0 (0 is the first, 1 is the second, etc.). Each Special Stage starts you off with 200 rings. Once completed, a Special Stage takes you back to the title screen. After completing a Special Stage, and regardless of which one, Not Used level 0 will show the bad ending (but not the screen with the Chaos Rings). Enabling the above stage select code also reveals an unused playable character, labelled by the game as "**********". Due to its appearance in game, ********** has, for many years, informerly been known as "Wechnia", a portmanteau of "white" and "echidna". This is because in-game, ********** uses garbled, palette-swapped sprites of Knuckles and the moveset of Mighty. ********** can also be selected as a partner. ********** is a curious creature, being second in the list of selectable characters (after Mighty) and using Mighty's sprites when entering a bonus or special stage. ********** is not, however, playable in normal gameplay without hacks - as soon as the character touches the floor, the game will freeze (and even if this is fixed, interactions with other objects will likely cause problems). 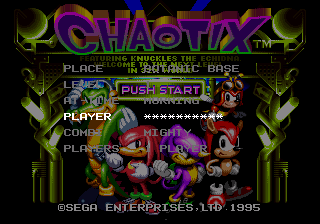 Incidentally this is the case with the majority of Chaotix prototypes, however up until the release of prototype 0119, ********** has an entirely different moveset - by holding the button after performing a double jump, the character will fly. ********** is, in fact, what remains of Tails, and further proof that Chaotix evolved from Sonic Crackers. With Mighty (in the first slot) being thought to have evolved from Sonic, ********** (in the second slot) was suggested to be Tails, though the addition of flight suggests more work went into the character after Crackers before he was scrapped. Sprites of Knuckles spinning around. Possibly could have been used as part of a death animation. Other "drunk" sprites exist for the rest of the characters excluding Heavy and Bomb. 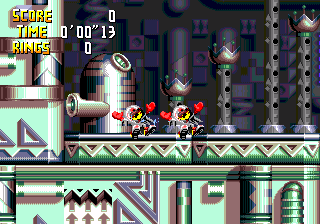 In Sonic Crackers, this feature can be accessed by repeatedly touching the upside-down spikes found in World 2 stages. An animated sprite of an unused Super Sonic. 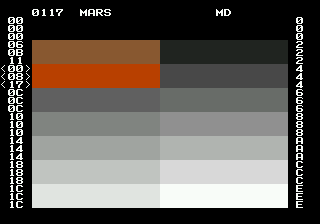 Colors are incorrect and fan-made, no known palette in the game matches. Unknown use; speculated as part of an intro/outro. An animated sprite of an unused Tornado with Tails. Unknown use; speculated as part of an intro/outro. An unused sprite of Vector, which was possibly part of his climbing animation. An unused banner-looking sprite. Possibly planned for use in the scrapped "Time Attack" mode. A bubble sprite. Obviously meant to be used in an underwater section, none are in the game. Animated splashing sprites. Same case as above. Animated spherical sprites. A yellow variant exists as well which suggests it might be an unused bumper sprite. This can also be seen in Sonic Mania when playing Studiopolis. Animation of a scrapped enemy. Zone of enemy is unknown, but it could be from Amazing Arena Zone, due to the similar palette. Animated Mosqui sprites, possibly used in intro. Metal Sonic Kai have plenty of animations that were never used in the game. On the Mega Drive's side, he got this Disembodied head that may have been used for his escape if you failed to collect all the Chaos Rings. While partially used, some specific animation frames of Robotnik in the "bad ending" are unused, as well as this background. Unused, however it was probably going to stay that way. Unused, unknown what it was intended for. Possibly a joke sprite. The japanese text reads "tobu" (とぶ), which translates to "to fly, to jump". The Sega screen at the beginning of the game was to have an accompanying sound. It can be heard by playing the sound effect 6B in the sound test menu. SAXT-DTWA Rings are worth 4. BC2A-EB2L Infinite time/your ring count constantly increase if it reaches zero. RE8T-A6XN + AN8T-AAE0 Enable level select. RFHA-A6TY + RFHA-A6W8 + AJLT-CA8W Enable debug mode. AAPT-CAF4 It doesn't cost any rings to call your partner (it usually costs 10 rings). SAPT-CNF2 Gain 10 rings every time you call your partner (don't combine with the "it doesn't cost any rings to call your partner" code). SAPT-CNF2 + NTPT-CAF4 Gain 100 rings every time you call your partner (don't combine with the "it doesn't cost any rings to call your partner" code). AKGA-AA3L Keep rings between levels. AC9A-BAGR Knuckles has mega jump. AEYA-CAG2 + AEDA-CADJ + AEET-CABA You only have to have 1 ring to access the special stages at the end of levels (you normally need 50 rings). FFE009:63 Have infinite 99 rings. FFADFC:01 Have speed shoes (leader). FFAEBC:01 Have speed shoes (partner). FFADC1:05 Enable grow (leader) (only works if always have shield is enabled). FFAE81:05 Enable grow (partner) (only works if always have shield is enabled). FFE01B:06 Have all chaos rings. FFDFFE:0606 + FFE000:0606 + FFE002:0606 All levels cleared (after completing a level). FFFFED:FF Amy appears in sound test. FFFCEA:0? Attachment to partner modifier (0: Not Attatched, 5: Attatched). FFFFEE:FF00 Enable level select (Pick "stage select" at the main screen). FFE20E:0500 Play as Bomb The Mechanic (must use at the "player select" screen). FFE20E:0600 Play as Heavy The Mechanic (must use at the "player select" screen). Start the ROM in Kega Fusion. Select TIME ATTACK in main menu. Advance through PLAYER and NPC SELECT. On ATTRACTION SELECT, create a Save State. Now, start the ROM in Gens and load the Save State (note: the game has a chance of crashing at this point). Enter the Genesis VDP viewer via CPU->Debug->Genesis VDP. If you can't see anything, select a different palette. As it turns out, the Sega screen at the beginning of the game was to have an accompanying sound. This has been confirmed in Chaotix (prototype 0202), although the sound is different. In the final, it is a different sound, but still is never used. It is located in the final game under the sound test menu with the SFX I.D. of 6B. Mighty: He's A Sonic Clone? 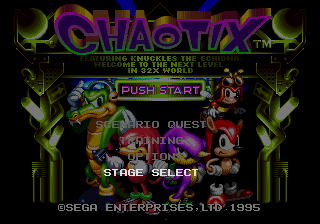 The absence of Sonic the Hedgehog as a playable character in Chaotix resulted in a lot of speculation from various members of the community, which often resulted in questioning whether Sonic was ever planned for Chaotix. Furthermore, the speculation is fueled with the presence of leaked games such as Sonic Crackers, which offers a similar gameplay engine to Chaotix, except with Sonic and Tails as the only playable characters. However, careful observation proves that Sonic may not be entirely absent from this game. Mighty the Armadillo is one of the available characters in Chaotix, who shares a lot of the behavior of Sonic in Sonic Crackers. As the sprite sheet above demonstrates, nearly all of Mighty's poses match up with Sonic's poses from Sonic Crackers, and occasionally Sonic the Hedgehog CD. Likewise, some of the unused poses in Sonic Crackers match up with Sonic. This page was last edited on 6 April 2019, at 13:25.